Andrew Lee McDaniel of Hemet, California shows off his first buck. 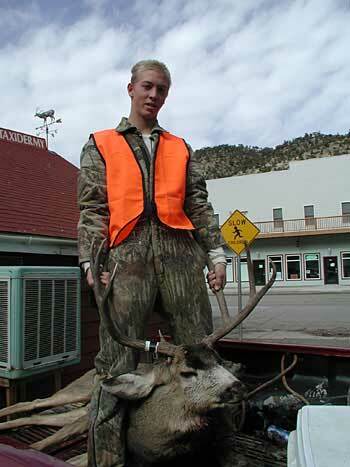 Andrew took this great 3x5 near Rifle, Colorado on November 9, 2000. Andrew is 15-years-old. Andrew was shooting a .270 and bagged his buck with a 100 yard shot. Editor, Jerry Springer, shot this photo outside the taxidermy shop in New Castle, CO as Andrew was getting ready to take his buck from the truck into the shop. What a great buck for Andrew's first one.